Strategies for behavior management and classroom productivity. Focused on the secondary level, but can be applied to all ages. 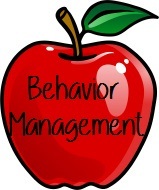 Thinking About Behavior Management - Behavior management. Sigh. This is something I struggle with, especially in the transition from high school to middle school. Classroom Organization – Computer Cards - In the week before classes began, I made these handy-dandy mini-binders what would be a great way to organize my class periods and computer information. Name Tags! - One of the first activities I had my new students do is make name tags. Okay, sounds a little elementary, right? Wrong. Even though making name tags on the first day might be something done back in Kindergarten, there’s a way to make it relevant for even secondary students. [Or at least somewhat!] And that’s by making it a name activity rather than just a tag. Welcome to My Classroom - I don't like the phrase 'classroom rules'. I prefer 'classroom expectations,' so that's what I implemented and talked about my first day of my first placement at Mason City High School. Philosophy of Behavior Management - I believe that through creating a curriculum that is driven, focused, and engaging, I will foster inherent behavior management in my classroom that will not only motivate my students to be self-directed learners, but also ensures that together we are accountable for their learning. Social Contract - As a future English teacher, my job is to make sure my classroom is safe, fun, orderly, and effective. One of the most basic ways I can do this is through a Social Contract.